I should mention that at this point we had already walked quite a bit (given two treks through St. Peter’s, a good half mile to the Metro and another two or three blocks from the Metro to St. John’s) while we stood and listened to Zadok’s interesting history of the surrounding landmarks, Joseph sat. And even looking at the front of the Church’s pavement now, makes me tired to think about even walking that distance. 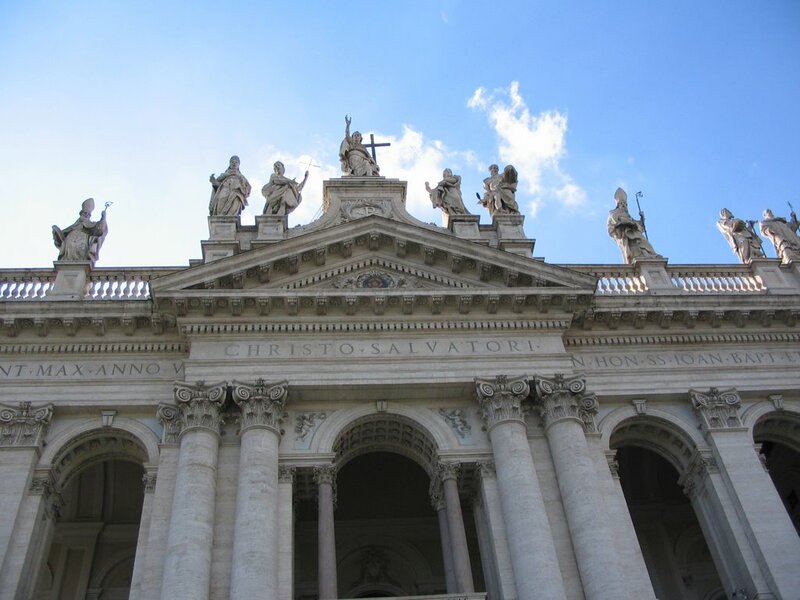 Most people think that St. Peter’s is the Cathedral Church of Rome, but it isn’t–St. 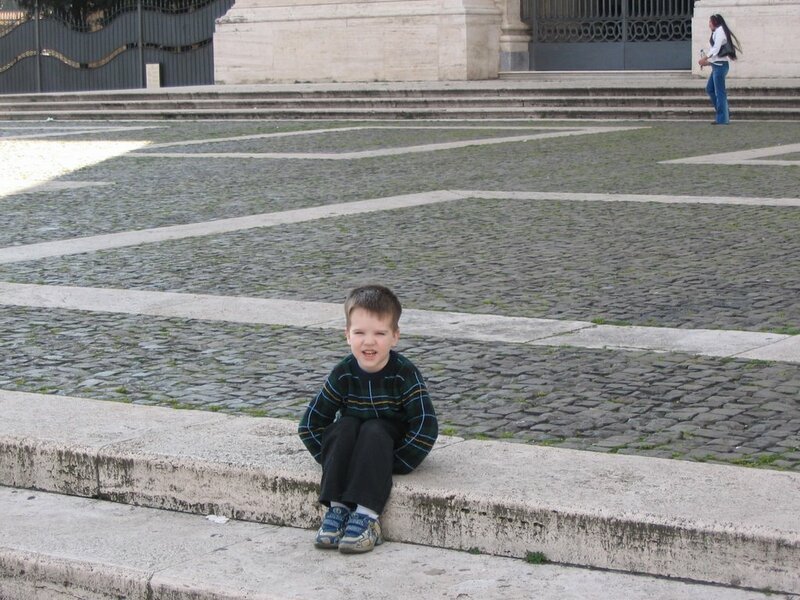 John Lateran’s is. 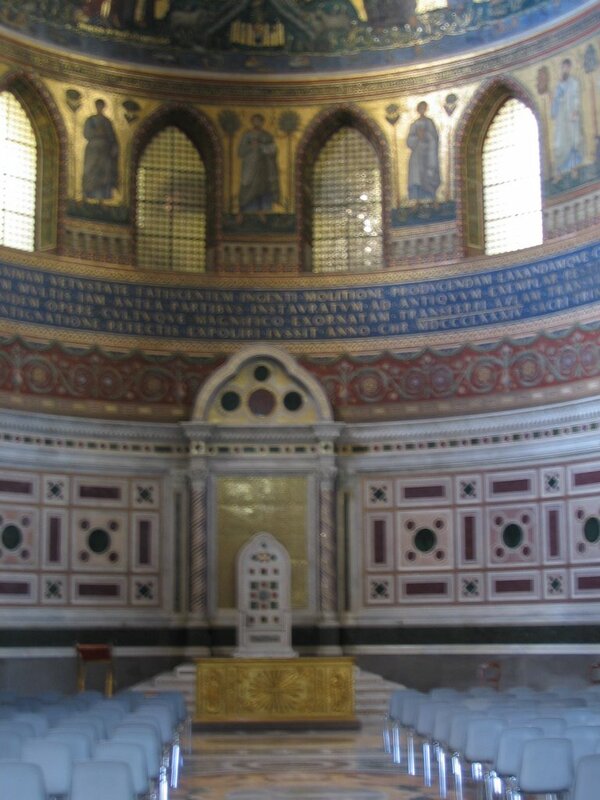 While the chair of Peter is in St. Peter’s, the Bishop of Rome’s chair is at St. John Lateran’s and this is the central feature of the apse of the Church, now that I think of it in a similar way to the way that the Chair of Peter is in the apse of St. Peter’s. When St. Francis of Assisi came to Rome to see the Pope, he came here to the Lateran and their are large statues of Francis and his crew directly across from St. John’s that seem to be in communication with the large statues that are on the facade of St. John’s. After his election as pope last April, Pope Benedict XVI came here to the Lateran to be formally installed as the Bishop of Rome (ever wonder why the Bishop of Rome isn’t an “archbishop”?). St John’s has it’s own Egyptian obelisk (just like St. Peter’s) and a very impressive Baptistry which next to the Pope’s chair is what I remember most about this part of our tour. The Baptistry was huge (I had seen one at the ruins of St. John’s in Ephesus twenty-seven years earlier that was quite small in comparison). There was some type of festival going on outside of the Church that seemed to be a “Mardis Gras” or “Carnivale” type of celebration, remember this was just before the beginning of Lent. So next to the obelisk were booths, screaming kids and some people dressed in costumes giving the “pope’s church” the feel of a regular parish back home. 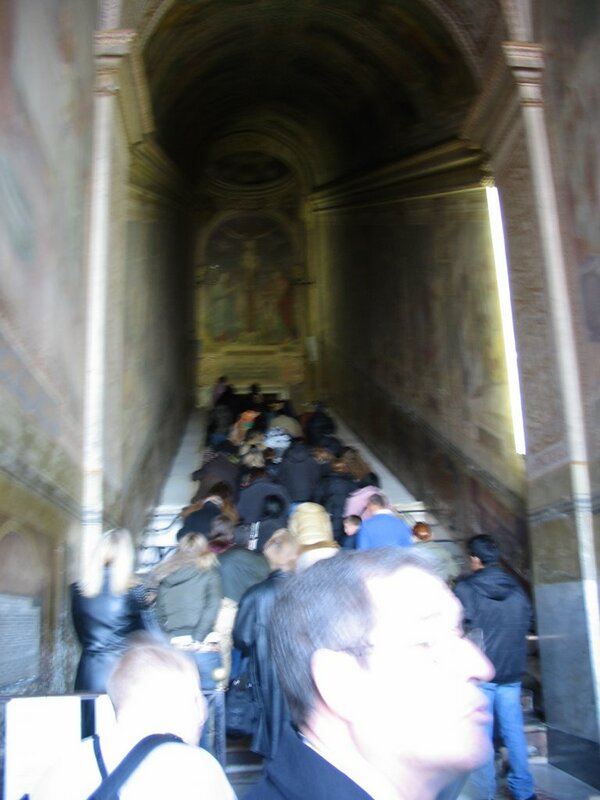 Across the street we visited the Scala Santa–the holy stairs, said to have been brought to Rome by St. Helena the mother of Constantine and to have been the stairs that Jesus would have walked on during his Passion when he came before Pontius Pilate. The faithful climb up them on their knees and as this picture will attest–there were no shortage of takes on the day we were there, in fact there were so many that it was really impossible to get near the steps to see them. We walked up the side steps to another chapel called the Holy of Holies because it contained many holy relics and an image of Christ reported to have been painted by St. Luke entitled “picture painted without hands”….any student of Catholic piety knows there are many images reported to have been painted by St. Luke (Our Lady of Czestochova being one example). I had never thought about it much before, but I wonder if another meaning might be that Luke’s Gospel inspired the works? I doubt the people working their way up on their knees think so..
Around the other side of the Holy Stairs was the remains of the Papal dining hall and an impressive mosaic, as we were viewing this site a woman begging rather aggressively started coming at us, and we moved on toward the Church in the distance…St. Mary Major. Walking along Zadok shared his knowledge of another area of his expertise the Irish Catholic Church begining with the Irish College, its history and various locations. We talked about the contributions the Irish priests had made to the world at large, Africa in particular and the United States (anyone who lives in the South knows the debt the Catholic Church owes to the Irish priests). What a marvel that where the Church is most vibrant right now is where the Irish planted the Faith. Pray for the Catholics in Ireland. At this point I became very tired, I think the baby might have fallen asleep on my back and as we learned this made him very heavy. So we stopped and Zadok, Amy, Katie and Joseph had gelato. I sat. Then up and at it again. A short visit into the Redemptorist Church where the original Our Lady of Perpetual Help is enshrined–a modern enshrinement, simple and I must say not much to my liking. Mass was being said so we weren’t able to really get close. Next to Saint Prassede, a very interesting Church decorated in a more Byzantine style with beautiful mosaics. This church contained the column that Christ was bound to when he was scourged. Evening was falling as we arrived at Saint Mary Majors, built on the spot where snow fell one August after Pope Liberius had dreamed that this would be a sign for him to build a church dedicated to Our Lady. As we entered the Church, the chanting of Vespers could be heard. My back was aching from the baby on it and I stole away from our tour to go into the side chapel and join in the praying of Evening Prayer. I grabbed a book and went to the first empty seat I could find which was in the front where I sat next to Cardinal Bernard Law. In spite of the comotion that I created, he did not even seem to notice. I fumbled around in the book trying to locate the point the prayer was at, but to little avail and after about five minutes Michael the baby decided to join in speaking loudly his own version of chant–at which point I made my exit. We toured the church and then started making our way back to the Metro station, thanking Zadok for his time and well presented tour. When we arrived back on Borgo Vitorio we stopped at a restaurant that Amy had spied the evening before. It was in the cellar and proved to be an excellent choice. We had a meal where everyone had what they wanted, for me it was a pasta with cheese and pepper and it was great,Joseph had a cheese pizzza, Katie a giant calzone, Amy another pasta dish, the baby had some of it all. Evening came, the second day. Amy Welborn's memoir of the months following the death of her husband, the author of this blog, Michael Dubruiel. Br>An interview Amy Welborn did with Kris McGregor of Discerning Hearts about the book.